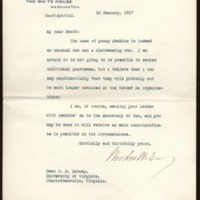 Woodrow Wilson writes to Richard Heath Dabney regarding guardsman, Jenkins. Confidential.The case of young Jenkins is indeed an unusual one and a distressing one. I am afraid it is not going to be possible to excuse individual guardsmen, but I believe that I can say confidentially that they will probably not be much longer detained at the border as organizations. I am, of course, sending your letter with Jenkins' on to the Secretary of War, and you may be sure it will receive as much consideration as is possible in the circumstances. Wilson, Woodrow, 1856-1924, “Woodrow Wilson to Richard Heath Dabney,” 1917 January 10, WWP20515, University of Virginia Woodrow Wilson Letters, Woodrow Wilson Presidential Library & Museum, Staunton, Virginia.